There were numerous professional microscope slide preparers active during the 1800s who left behind skillful works, but without indications of the makers’ names. Others placed only their initials or other tantalizing clues to their identities on slides. One such maker labeled many of his slides with the initials “J.W.B.” It had previously been hypothesized that JWB was J.W. Burgess, based upon that man’s involvement in the Quekett Microscopical Club during the 1860s-70s. Research into his life revealed that Burgess could not have been JWB (see the article on John W. Burgess at this site). Below, we discuss the monogrammed slides of JWB, along with identification of other, non-monogrammed slides with the same handwriting. Following that is evidence to support the conclusion that JWB was probably James William Bond. Two styles of lithographed papers bearing JWB’s monogram are known (Figure 1). Both are fundamentally the same, with parallel chain devices running the length of the paper, bordered with a Greek key design. Ovals are present at either end. One type carries a script “J W B” in the lower oval, the other being left blank. The specimen name was often written in the blank oval, although in some cases, as with the slide shown in Fig. 1B, it was left empty. The pasted-on label of slide 1B bears a handwriting distinct from that on other JWB slides, and is of uncertain origin. The second type of monogrammed papers has blank ovals, but a small “J W B” on either side of the specimen. The first style would have had the advantage of being recognizable from a distance. A disadvantage would be that retailers could cover over the monogram with a label, thereby taking the credit away from JWB. The second paper style avoided that problem for the maker, although the tiny size of the monogram and its geometric fashion makes it very easy to overlook. Nonetheless, these distinctive paper patterns may have stood out enough to catch the eyes of discriminating customers. Figure 1. 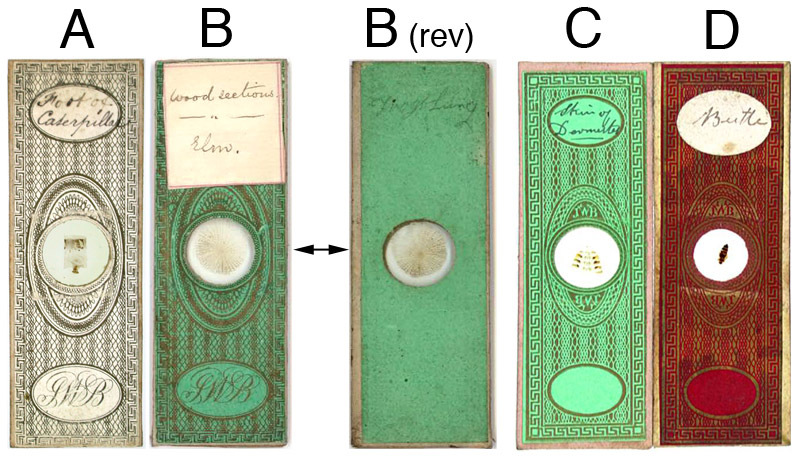 Examples of microscope slides with monogrammed JWB papers. (A) Black ink on white paper, with a large script monogram in the lower oval. (B) Gold ink on green paper, otherwise identical to slide A. The square label bears a handwriting that is different from JWB’s, and is of unknown origin. Underneath this square label, the upper printed oval is completely blank. The reverse of this slide inexplicably has the words “Frog Lung” penciled in JWB’s handwriting [B (rev)]. Many other slides by JWB, of all paper styles, also carry a description of the specimen written on the reverse, written in pencil by JWB. (C) A paper fundamentally similar to those in A and B, with the monogram JWB in small, geometric letters on either side of the specimen. Both large ovals are empty of print. Gold ink on light green paper. This style and color is most often encountered in modern times, and may therefore have been the most widely-used of JWB’s monogrammed papers. (D) Same pattern as C, gold ink on red paper. The same style of handwriting appears on almost all JWB monogrammed slides, and is presumed to be that of the maker. That handwriting can be recognized on a number of other, non-monogrammed slides. Figure 2 illustrates some examples, along with similar slides bearing a JWB monogram. The three small slides shown in Fig. 2D are part of a 32-slide set, all of which fit snugly into a cardboard box (Figure 3). The similar handwriting is particularly obvious when comparing the two illustrated slides of butterfly wings, where the identities extend to the abbreviation “butty”. The cover slips of the small slides are made of mica, suggesting origins prior to 1840. On occasion, 1x3 inch slides are encountered that bear the same star-patterned paper and JWB’s handwriting (Figure 4). 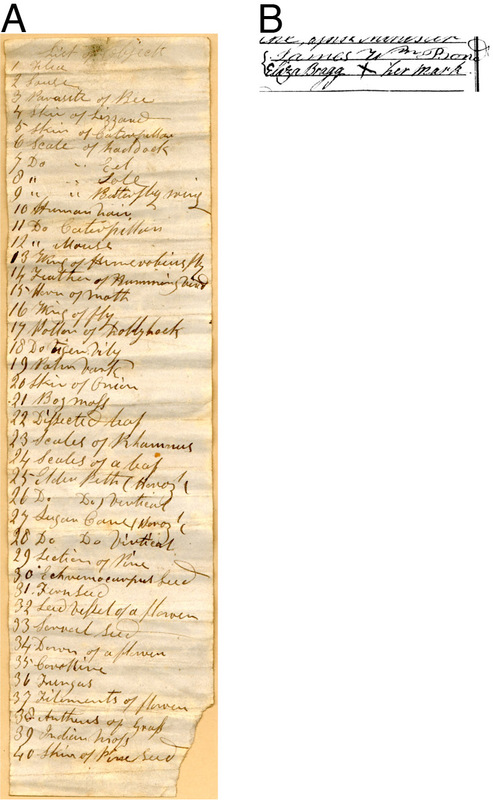 Additional examples of JWB’s handwriting are seen in a list of specimens from that early time period (Figure 6A). Figure 2. Non-monogrammed slides bearing handwriting similar to that of JWB, alongside known examples of his work. (A) “Lancets of tick.” Dark blue paper with gold stars on front and back, with plain, light-brown paper on the edges. The cover slip is irregularly-cut glass. (B) “Tongue of house fly.” Pale blue-green paper with gold stars on the front and back, without paper covering the edges. The slides are two to three times the thickness of modern microscope slides, are unevenly cut, but have finely smoothed edges. The cover slips are irregularly-cut glass. (C) “Trachea.” Pale blue-green paper with gold stars on the front and back, and light brown paper along the edges. The slide is of a thickness comparable to modern glass slides, and was cut with squared corners. The cover slip is irregularly cut glass. (D) Three small slides, part of a boxed set of 32 (see Fig. 3). From top down, “wing of butty” (sic, butterfly), “scales of butty” (sic), “wing of bee”, and the reverse of the “wing of butty” slide. The fronts of the slides are covered with blue-green paper with gold stars, and the sides or the reverse are without papers. The glass slides are roughly-cut, and the cover slips are circles of mica. Figure 3. A box of 32 dry-mounted slides which bear JWB’s handwriting. (A) All the slides and the opened box. Note the embossed pattern in the cardboard of the box lid. (B) The closed box. (C) The slides inside the box. The fit is perfect, suggesting that the box was custom-made for this purpose and is original to the slide set. (D) The bottom of the box, with handwritten “No 2”, the “2” crossed out and a number “1” added. This suggests that this group of slides, and at least one other, constituted regular sets produced by JWB. Figure 4. 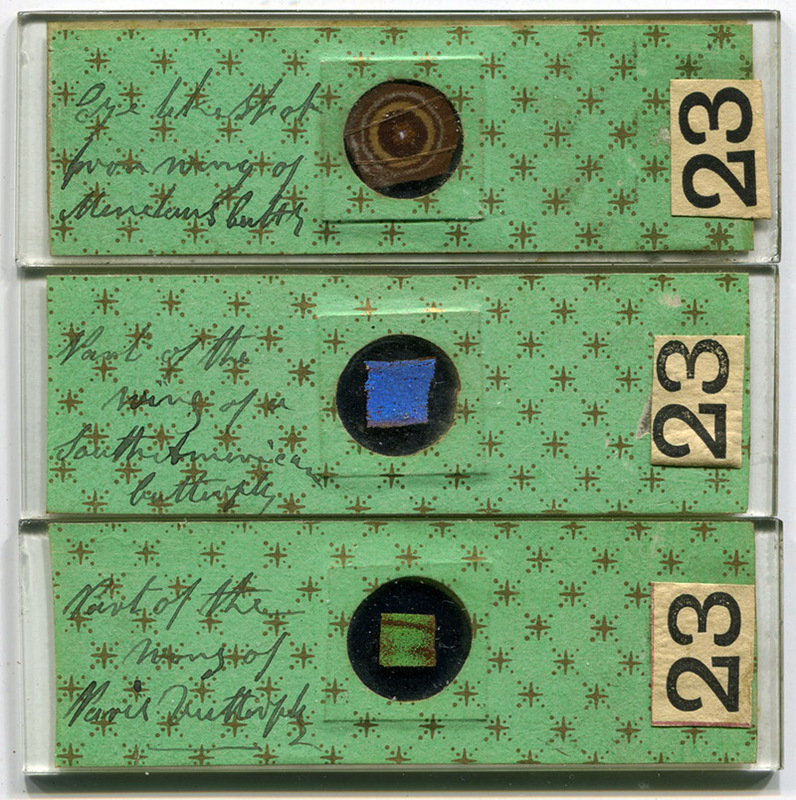 Three standard sized (1 x 3 inch) slides with star-patterned paper and specimen descriptions in JWB’s handwriting. Note that he wrote "Butty" on the top slide. The paper covers do not show evidence of previous folding, indicating that the slides were originally prepared this way, and are not re-mounts of early Continental-sized slides. The reverse sides of the slides also contain the same paper, but the edges are not covered. Figure 5. Two microscope slides by JWB, with labels indicating retail by scientific instrument dealers Horne and Thornthwaite. The handwriting on the labels is the same as found on many later JWB slides, perhaps that of one of his children or an assistant. Significantly, this handwriting on labels for Horne and Thornthwaite indicates that JWB made these slides specifically for sale by that retailer. Horne and Thornthwaite moved to 416 Strand in early July, 1875. That helps date when JWB used this style of slide papers. Moreover, if JWB was indeed James W. Bond, then these slides demonstrate that Bond was still producing slides until nearly the end of his life. Bond was an important figure in 19th century microscope preparing: he was a pioneer in the use of balsam as a mounting medium in the 1830s, he was recommended as a preparer of slides by John Quekett in the 1850s, and was well-known to the Royal Microscopical Society in the 1870s. Despite his apparent fame, no slides are known that bear James W. Bond’s full name. James William Bond born 4 June, 1803, in Bethnal Green, Middlesex, son of William and Hannah Bond. He was christened on 25 Dec., 1803 at St. Matthew’s, Bethnal Green. James married Eliza Bragg on 26 August, 1822, at the St. George Parish Church. Their first daughter, Mary Ann, was born in 1827. Her birth record indicates that James’ occupation at the time was as a weaver, and the family lived on Holywell Lane in the St. Leonard’s Parish of Shoreditch. By the time of the next child’s birth, in 1829, the Bonds had moved to New Inn Yard, Shoreditch, and James was still working as a weaver. On his fourth child’s christening record, in 1836, James described his occupation as “gentleman”. This was a time during which Bond was publishing on his studies of insects and making presentations to the important Entomological Society, so his exaggerated claim of station may reflect his ambitions. By 1842, the Bond family had moved back to Bethnal Green. On the 1844 christening record of daughter Evelina, James described himself as being an optician. In those times, the term “optician” was applied to anyone who worked with optics or lenses of any sort, including microscopists and photographers. Bond published a series of short articles on insects in the Entomological Magazine in 1833. For four of them, he signed himself “William Bond”, while the fifth was signed as “James W. Bond.” Printed comments by the editor, and the journal’s “List of Contributors” indicate that all these articles were written by the same man. The articles include a report of an 1828 experience in rearing gypsy moths, and the results of an 1829 insect collecting trip to the Hainault Forest. Bond’s publications were of such significance that they were cited in the scientific press as recently as 1987. Bond published again in the Entomological Magazine in 1836, on ants, Cletus arcuatus beetles, and wasps’ nests. The C. arcuatus article referred to his previous paper of 1833. The 1836 article was signed “J.W. Bond, 4, Lenham’s-buildings, Friar’s-mount, Church-street, Bethnal-green.” In 1836, Bond donated to the Entomological Club “some rare British Cerambycites, in a high state of preservation,” and “various Brazilian insects,” and the following year, “various British insects”. Despite those papers and donations, there is no evidence that Bond was ever accepted as a member of the Entomological Club or any other scientific organization. J.W. Bond appears to have had a broad range of scientific interests. He contributed money toward the publication of John Ralfs’ 1848 book, The British Desmidieae. The list of subscribers for Ralfs’ book is a who’s who of mid-1800s microscopy, including J.S. Bowerbank, W.B. Carpenter, J. Quekett, H. Powell, G.A. Walker Arnott, J.B. Dancer, W.H. Darker, and C.M. Topping. Many of those men were members of the Microscopical Society of London (later the Royal Microscopical Society), although Bond was not part of that club. John Quekett, in his first, 1848 edition of A Practical Treatise on the Use of the Microscope wrote, “Canada Balsam - This excellent material, first suggested by Mr. J.T. Cooper, and employed about the year 1832, by Mr. Bond, an ingenious preparer of microscopic objects”. For his second (1852) and third (1855) editions, Quekett amended this text to, “Canada Balsam - This excellent material, first suggested by Mr. J.T. Cooper, was employed about the year 1832, by Messrs. New and Bond, ingenious preparers of microscopic objects”. That he was referring to J.W. 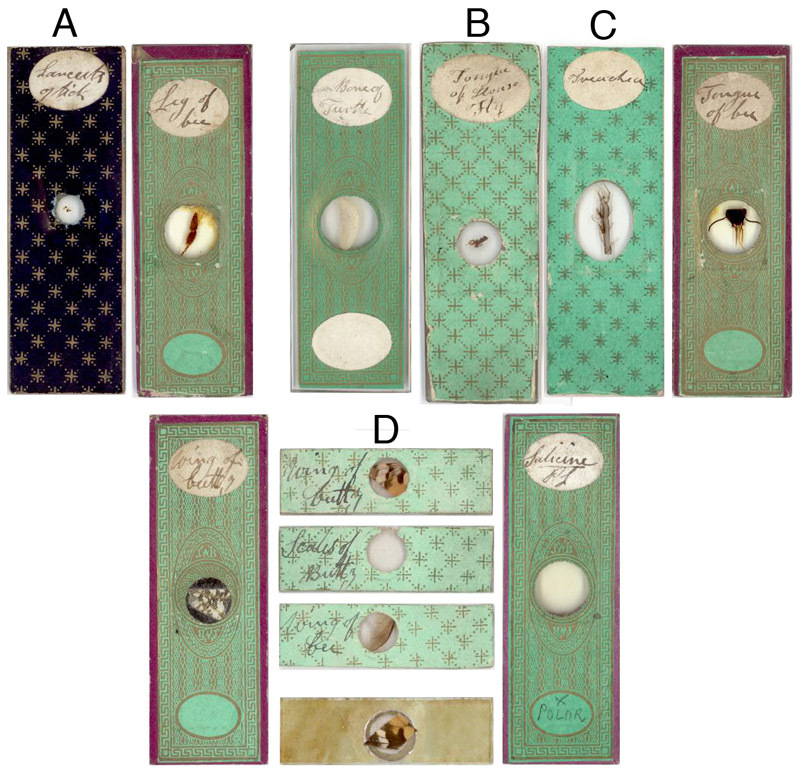 Bond becomes clear when, in the 1852 and 1855 editions, Quekett lists a limited number of worthy microscope slide makers: C.M. Topping, W. Darker, J.T. Norman, C. Poulton, G. Carter and “Mr. J. W. Bond, of No. 1. Emma Street, Ann’s Place, Hackney Road”. The 1851 census located our James W. Bond at that address. Figure 6. 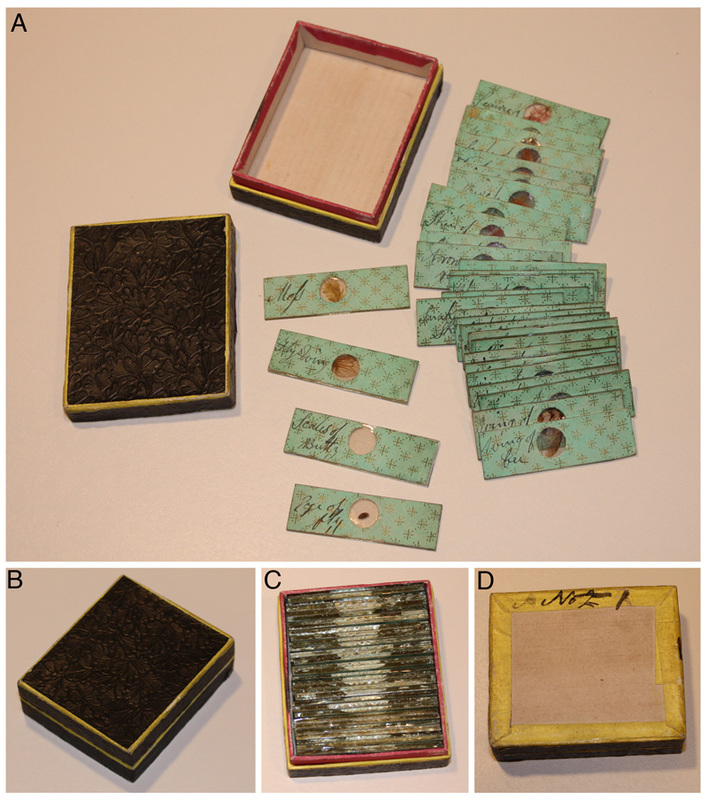 (A) A list of 40 objects that accompanied a set of microscope slides similar to those shown in Figure 3. Probably dates from the 1830s-40s. (B) The signature of James William Bond, from his 1822 marriage record. There are striking similarities with the signature and some letters in the specimen list, such as the capital “W”. Note, however, that the 19-year old Bond included several affectations in his signature, such as the curlicues at the beginning and end of his surname. Further details about J.W. Bond’s involvement with developing balsam as a mounting medium can be found in James S. Bowerbank’s Reminiscences of the Early Times of the Achromatic Microscope, read before the Royal Microscopical Society on 11 May, 1870, and published in the Monthly Microscopical Journal that same year. On the topic of Canada balsam, Bowerbank stated “this valuable and effective mode of mounting microscopical objects, I am informed by Mr. Topping, was originally suggested by Mr. J.T. Cooper, an eminent analytical chemist, and was first applied to the preparation of large objects for exhibition by the solar microscope by a person of the name of Newth (sic), who was employed by the late Mr. Carpenter, the optician, of Regent Street, to exhibit them with the microscope, and who subsequently carried on a very profitable trade in objects so mounted. Mr. Bond afterwards obtained the recipe from Newth (sic), and supplied the microscope at the Adelaide Gallery with such objects for a considerable period.” Bowerbank’s choice of words is telling: New was described as if unknown (“a person of the name of Newth”), while Bond was described as if he was already known by the audience (simply “Mr. Bond”). It is significant to note that Bowerbank was also a member of the Entomological Society when J.W. Bond presented to that club in 1833 and 1836 (see above). Proof that Bowerbank was referring to our J.W. Bond is his mention of Mr. Bond as being a supplier for the “microscope at the Adelaide Gallery”. This was a powerful oxy-hydrogen projection microscope credited with “magnifying nearly 3,000,000 of times; for instance, the common bed bug to the length of about 20 feet, and the flea in the same proportion”. Of this microscope, in 1850, the Pharmaceutical Journal quoted an employee of the Adelaide Gallery as declaring, “In every drop of dirty stagnant water … we are generally, if not always, able to perceive, by means of the microscope, moving bodies, from 1/1150th to 1/25000th of an inch in diameter, and which often live packed together so closely, that the space between each individual scarcely equals their diameter.” The article further commented that “statements like these, though literally true, lead to very exaggerated notions in the public mind of the actual animalicular impregnation of the ordinary drinking-waters supplied to us by the water companies; and the erroneous impressions thus obtained have been heightened by the public exhibitions of aquatic animals, by means of the oxy-hydrogen microscope. The animals shown on these occasions are usually larvae of insects, and are caught in stagnant pools around the metropolis. Some years ago, at one of these exhibitions at the Adelaide Gallery, an old lady inquired whether the animals shown were found in the water which people were in the habit of drinking? ‘These insects, ma’am,’ gravely replied the exhibitor, ‘are contained in New River water’ – an answer which was literally true, for the animals had been the day previously caught in a pool at Hampstead, and had been transferred to New River water .” A footnote to this article states “Mr. William Bond, of No. 1, Emma Street, Ann’s Place, Hackney Road, is a well-known purveyor of living objects for the oxy-hydrogen microscope”. Whether or not Bond was the grave exhibitor is unknown. Bond’s association with J. Quekett led to the only microscope slides that we can definitely declare as having been produced by James W. Bond. Quekett catalogued the Royal College of Surgeons “Collection of Preparations of the Elementary Tissues, both healthy and morbid, of Animals and Vegetables, adapted to illustrate the results and uses of microscopical investigation”. These included five microscope slides donated by “Mr. J.W. Bond”. The handwriting on the slides is that of John Quekett (Figure 7). Figure 7. 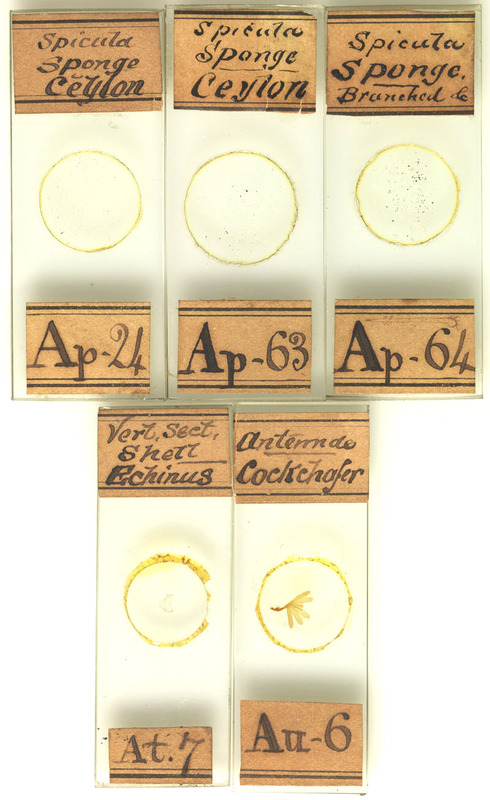 Five microscope slides donated by J.W. Bond to the Royal College of Surgeons. The handwriting is that of John Quekett, curator of the museum. Quekett’s Descriptive and Illustrated Catalogue of the Histological Series contained in The Museum of the Royal College of Surgeons of England, vol. 1, describes the slides as follows: Ap24, Spicula obtained from a Sponge attached to a coral found in Ceylon; Ap63, Spicula obtained from a Sponge attached to a Coral dredged up at Ceylon; Ap64, Spicula obtained from the same Sponge; At7, A vertical section of the shell of an Echinus, made through one of the large tubercles to which the spines are attached; Au6, Antenna of a male Cockchafer. Copyright © the Hunterian Museum at the Royal College of Surgeons of England. Unfortunately for historians, J.W. Bond seems to have avoided the limelight. There are no known records of him joining any entomological or microscopical societies. Although he made numerous contributions to the Entomological Society during the 1830s, and styled himself as a “gentleman” at that time, there are no indications that he was accepted into that club as a member. 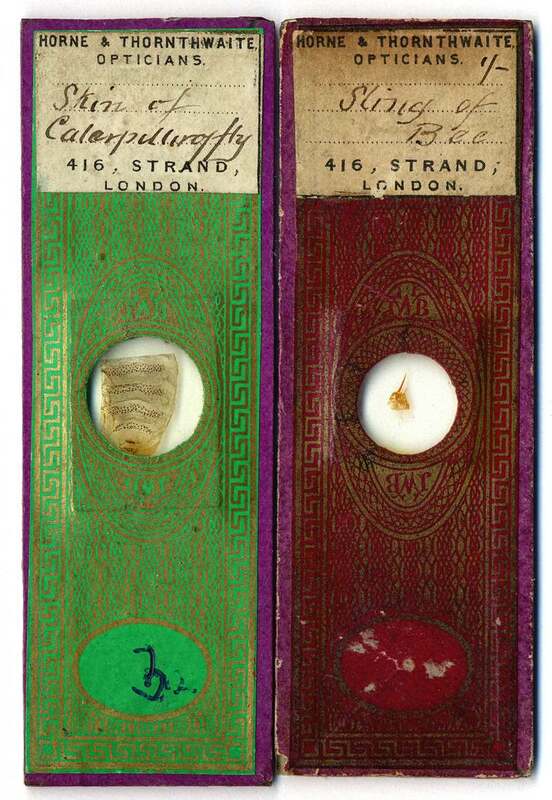 Bond did not exhibit microscopical specimens at either the 1851 or 1862 London Expositions. Bond lived most of his adult life in Bethnal Green. He lived at Ann’s Place, Pritchard’s Row in the Hackney Rd. area in 1841, nearby at 1 Emma St. in 1851, again close by at 2 Gwynne’s Place in 1861, then 501 Hackney Road from 1862 until at least 1881. James was always described on censuses as being an optician. By the 1860s, he had delved into photography. His son, William, became a builder of pianofortes. By 1864, the Bond optometry shop had expanded its repertoire to include William’s work, as shown by the following advertisement, “Pianofortes, New and Second-hand – For a First-Class Piano, go to W. Bond & Co., where you will obtain one, which for beauty and brilliancy of tone, will satisfy the most fastidious. All instruments warranted. Observe the Address – 501, Hackney Road, 15 doors down from Cambridge Heath Gate”. Although James did not exhibit any of his microscopical objects at the 1862 International Exhibition, he did help his son William to exhibit a new form of piano wrest plank. James’ wife, Eliza, died in 1880, at the age of 78. James was 84 when he died of “senectus” (i.e. old age) on 28 October, 1887. A colleague, who evidently knew Bond, wrote in 1901 of watching a magic lantern show that featured preparations by Bond: “During the evening, when showing the optical lantern, a number of ’natural objects’ were projected on the screen. These carried me back some years, and from certain remarks passed afterwards it appears, if not a novelty to them, they were quite a revelation to some of the audience. It brought to my mind a tinge of sadness, for I recognised the work of poor Bond, who for many years used to mount microscopic objects for the table instrument, and now and then large butterflies, beetles, moths, spiders, ferns, seaweeds, &c., on 3 inch circular or square glasses for the magic lantern. The objects were in Canada balsam between two glasses, and if not kept in the stage of the lantern too long stood the heat very well. The high-power jets of recent years are somewhat too much for them unless a heat absorbing tank is used. The scientific world is the poorer for the loss of such men as Bond”. The above-described information indicates that James W. Bond was a significant player in 19th century microscopy. He was an early user of balsam as a mounting medium. Quekett thought enough of Bond’s work to ask for his advice on microscopical specimens and to recommend him to readers. J.S. Bowerbank, and apparently other members of the R.M.S., knew Bond’s name. However, no slides bearing Bond’s full name are known today. Was J.W. Bond’s work known well enough in his time that his initials were sufficient for identification? Although there is not yet a “smoking gun”, the available evidence points to the conclusion that microscopist JWB was James William Bond. Many thanks to Q.J.M. co-authors Howard Lynk, Brian Davidson, and Peter Paisley: to Steve Gill for his generous advice; to Sarah Pearson for outstanding assistance in helping us to acquire photographs of James W. Bond’s microscope slides; to the Hunterian Museum of the Royal College of Surgeons for permission to reproduce images of the Bond slides; and to Jenny Bowey, descendant of James W. Bond, for her generous help in assembling information on her ancestors. Census and vital statistics databases for England, accessed through ancestry.co.uk.